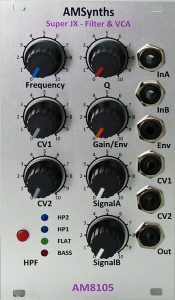 Overview This module is a clone of the 24dB Low Pass Filter, fixed High Pass Filter and VCA in the Roland Super JX10. 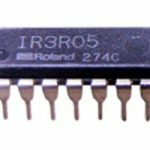 The circuit is based around the Roland IR3R05 chip which first appeared in the MKS80 REV5 replacing the IR3109 and CEM3360, and then made its way into the JX-8P, MKS70, JX10 and Alpha Junos. The filter and VCA was usually followed by a fixed High Pass Filter in these polyphonic analog synthesizers. The 14-pin DIL chip contains two 2-pole State Variable Filters configured as a 4-pole Low Pass filter only. The chip has external capacitors with two internal VCA’s; one for voltage controlled Resonance and one as the final VCA in the signal chain – with both Exponential and Linear voltage control. The IR3R05 does not go into self oscillation at high Resonance levels, this is a deliberate design by Roland to stop distortion and to provide a smoother sound. Detailed Description The AM8105 module is based around the original IR3R05 as wired up in the JX-10, and released in 2015. The chip delivers a 4-pole voltage controlled low pass filter, with a smooth and controlled resonance. There is a linear VCA input for connnecting an external ADSR, the VCA exponential input is not used. The VCA is followed by a fixed High Pass Filter which has 2x HP modes and a wicked Bass Boost. These modes are selected by a momentary push button, with 2x indicator LED’s. The front panel has rotary pots for Frequency Cutoff (FREQ) and two frequency modulation pots; CV1/KYBD has an external input in CV1 but defaults to the Dopefer bus keyboard CV as a keyboard CV. 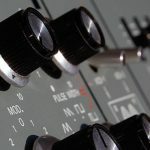 The VCA gain is controlled by the GAIN potentiometer, which doubles as ENV level amount when an ADSR is connected to the ENV input. A Resonance potentiometer enables increased Q factors into the start of self oscillation. There are 2x signal inputs with level controls (SIGNALA and SIGNALB). 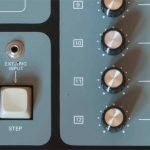 This module has a really nice smooth and laid back filter with the added benefits of an onboard VCA and a fixed filter to cut or boost the output. 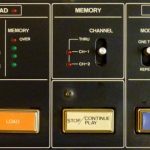 Just connect one of our dual ADSR’s and a dual VCO and you have a complete synthesizer! Module Availability The AM8105 was available in 2014-16 and around 25x were manufactured. A final run of 5x may be manufactured in 2018, after that I have run out of NOS IR2R05 chips and no new modules will be made.